Happy first day of spring, everyone! This time of year always gets me so excited because I live for nice days and warmer weather. Although, spring is playing some nasty tricks on us this year because they're calling for another nor'easter around here. Like seriously, get it together. The weather has to get nicer at some point, right? It's no surprise over here that I am not the most tidy or organized person out there. I am making some great progress though and it's amazing how implementing some small changes can really make a big difference. When I think of spring cleaning, I don't always jump to the typical mindset of cleaning every nook and cranny. I've shared before about 5 ways to spring clean your blog and 5 ways to spring clean more than just your home. 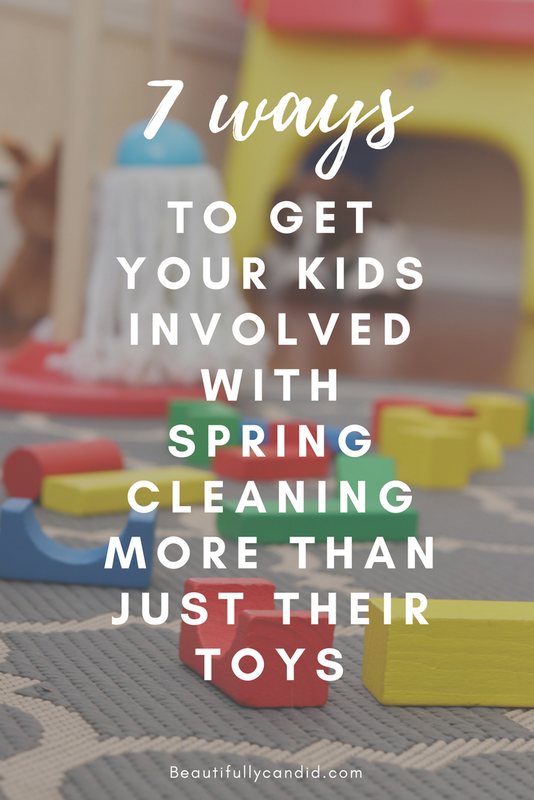 This year, I decided to break away from sharing five things and got ambitious with sharing seven (I'm such a rebel) ways to get your kids involved with spring cleaning more than just their toys. 1. ORGANIZATION: decorative storage bins have been so helpful for us, especially in their play room. Even with all of our bins around, I still get asked at least once a day where one of their toys are. Somehow Moms are just supposed to magically know where everything is, right? After A had a meltdown because he couldn't find one of his beloved Paw Patrol toys, we deiced to have a designated bin for all of those specific toys so he can keep better track of them. We've also done this now with their stuffy friends and superheroes. 2. SETTING GOALS: setting goals has been a big thing in our house. We utilize an app or start charts that the boys can works towards earning things so it was the perfect time to put some goals in place for the spring. 3. MAKE CLEANING FUN: what I've learned with kids is if you make something fun or turn it into a game you are more likely to capture their attention and have them participate. They enjoy seeing who can match the most socks, using the garbage bin as a bucket and throwing things in there like a basket ball. 4. ADDING IN AN INCENTIVE: who doesn't love a little incentive for doing some extra help. My boys have really been into finding change lately so this has been a motivator for them to want pick things up. You know, in case they find some extra "monies". We may or may not leave a few coins laying around so they really think they are finding things. 5. OUTSIDE ORGANIZATION: our back door is right off of our kitchen and where majority of their outdoor toys are. Just like how they ask me where something is in the house, they'll ask about their things outside too. We use an old wash tub for them to put majority of their things in but being organized outside can also be as important as being organized inside. 6. BEING KIND: we also talked to the boys about ways they can be kind to others at school or when we are out at places. We asked them what they thought they could do and A said, he could play with someone new and share his toys, and little nugget wants me to pack extra smoothies and stickers for his best friends everyday. We're still working on him coming up with some other ideas. 7. GIVING COMPLIMENTS: The boys new thing has been coming to Eric and I and saying that one of them is lying about something or being mean to each other. Instead of allowing them to continue complaining about things (of course we also hear their thoughts and let them work it out) but we also follow up with having them give each other a compliment or say something nice about each other.